Danny Miller was recruited to the University of Miami out of Clewiston, Florida by Coach Lou Saban but flourished under Coach Howard Schnellenberger. 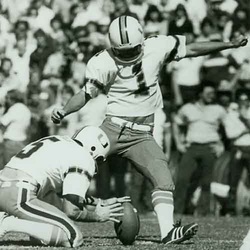 Danny Miller was one the most prolific kickers in University of Miami history, and in 1981 was a first team All-American. Miller claims to have learned to kick in Clewiston, Florida where growing up some neighbors had a grove of banana trees with leaves intertwined to look like goal posts and he imitated the soccer style kickers he had seen on TV. Danny holds the UM record for longest field goal, a 57 yarder against Florida State in 1981, and remains second all time for most field goals. He is listed as one of the top five NCAA career field goal kickers. He hit two crucial field goals in the Miami Peach Bowl victory in 1980 but is probably best remembered for the game winning 55 yard field goal against Florida in 1981 that bounced off the upright and through. He was drafted in 1981 in the eleventh round by the Washington Redskins, played for New England, later Baltimore in 1982 and joined Jim Kelly as a USFL player in 1984 and 1985. In 1984 he kicked five field goals to lead the Birmingham Stallions of the USFL to a quarterfinal win and in 1985 kicked the game winning field goal for the Birmingham Stallions against his former UM teammate Jim Kelly who played for the Houston Gamblers. Danny was also known as "Miller Time" every time he walked onto the field.